A transgender person is running for office in Utah for the first time, and could become the first trans person elected in the state. Sophia Hawes-Tingey, a U.S. Navy veteran, is running for city council in the city of Midvale on a platform of improving community safety, environmental stewardship, and corporate responsibility. Hawes-Tingey first made news in January 2014, when she and her wife, who is also a transgender woman, were legally married in Utah. Although a city council race isn’t exactly national news, it’s drawing national attention. But Hawes-Tingey told Salt Lake City’s Fox 13 she’d rather that her gender identity doesn’t become the focus of the race. There are also three other openly gay and lesbian candidates running this year, all in Salt Lake City: Jackie Biskupski, a former state legislator who’s now runnig for mayor, and Derek Kitchen and the fabulously-named Babs de Lay, both running for city council. Update, June 4: Sophia Hawes-Tingey writes in with an important set of corrections, which I’ve reprinted here in full. I need to clarify a couple of the “firsts” that are being reported. 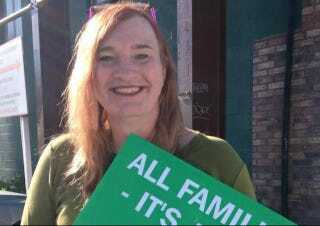 The distinction of being the first openly transgender person to run for office in Utah belongs to Jennifer Jackson who ran for the Utah State Senate in 2006. Jennifer was out in convention. Therefore, she’s first. and I’m second. It turns out that I will be the first to appear on a public ballot, and am the first to try to run openly for a municipal seat, but we need to give credit to the brave individual who actually was first. As for the first two transgender women to be legally married in Utah, you need to add at least two distinctions, first openly, and second to each other. There were transgender women who married before the ruling in December 2013, just not as both of them being out transgender women, and there certainly were transgender women who were legally married during the famous 13-day window before my wife and I made it legal on December 30th.